Being exposed to the elements at all times, windows get easily filled with stains, bird droppings, dust and filth. Cleaning external windows is a risky task especially if they are on a high places. We specialise in professional window cleaning which can be used by the residents living in Finchley every day of the week. 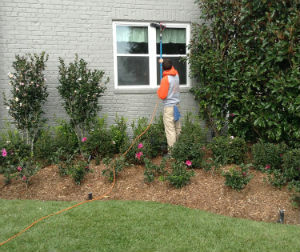 We use advanced and effective equipment which ensures flawless washing of high and hard to reach windows. Get in touch with us to order the window cleaning which you need. We work during weekdays, weekends and bank holidays with no change in the price of the service. Windows which are up to 300 feet high will be cleaned through cherry pickers, scissor lifts or hydraulic platforms. Our staff use water fed poles to wash windows which aren’t too high and can be reached from the ground. They use extensions which let them clean windows high up to 80 feet. Our cleaning workers use purified water which is supplied from van-mounted containers and extracted from the poles. The soft brush help remove filth, dust and grime. The windows are cleaned, rinsed and left to dry. Our cleaning staff use hydraulic platforms and cradles to reach higher located window glasses and frames. Order the window cleaning which you need using our safe and professional services which we provide in Finchley during the whole week. You can rely on our staff to ensure the spotless, shiny and impeccable condition of the windows in your property. They work according to the Safety and Health requirements and test the devices before using them. We offer professional, safe and affordable window cleaning which is available in N3 seven days in the week.